Hydrofluorocarbons (HFCs) are a group of industrial chemicals primarily used for cooling and refrigeration. HFCs were developed to replace stratospheric ozone-depleting substances that are currently being phased out under the Montreal Protocol on Substances that Deplete the Ozone Layer. Many HFCs are very powerful greenhouse gases and a substantial number are short-lived climate pollutants with a lifetime of between 15 and 29 years in the atmosphere. Though HFCs currently represent around 1% of total greenhouse gases, their impact on global warming can be hundreds to thousands of times greater than that of carbon dioxide per unit of mass. 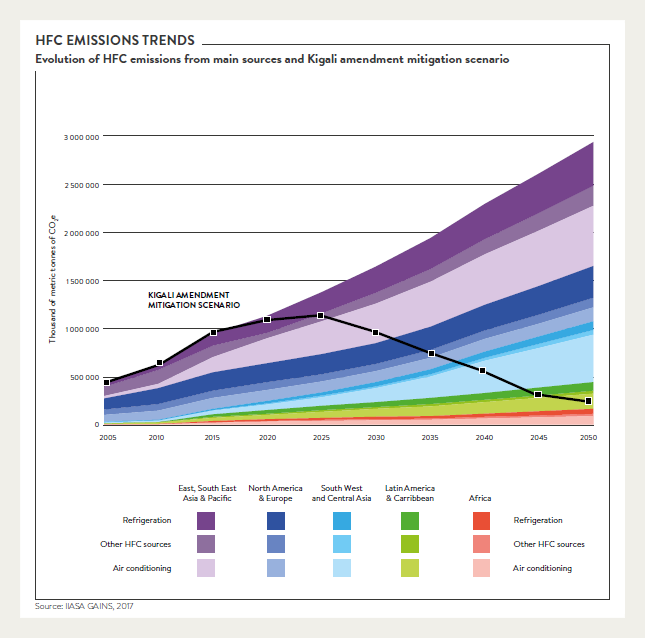 Assuming no new regulation, HFC consumption is projected to double by 2020, and emissions could contribute substantially to radiative forcing in the atmosphere by the middle of the century. The Kigali Amendment to phase down HFCs under the Montreal Protocol entered into force in 2019. Under the amendment, countries commit to cut the production and consumption of HFCs by more than 80% over the next 30 years to avoid more than 70 billion metric tons of carbon dioxide equivalent emissions by 2050 -- and up to 0.5° C warming by the end of the century. Solutions are available to replace high-global warming potential HFCs in many sectors and reduce emissions. HFCs are entirely man-made. They are primarily produced for use in refrigeration, air-conditioning, insulating foams and aerosol propellants, with minor uses as solvents and for fire protection. Most HFCs are contained within equipment, so emissions are the result of wear, faulty maintenance, or leakage at the end of a product’s lifetime. HFCs have only been commercialized since the early 1990s, and their abundance in the atmosphere is currently small. They are, however, among the fastest growing greenhouse gases, largely as a result of increasing demand for refrigeration and air-conditioning, particularly in developing countries. Emissions of these gases are growing at a rate of 10-15% per year, which will cause a doubling every five to seven years. HFCs are potent greenhouse gases that can be hundreds to thousands of times more potent than carbon dioxide (CO2) in contributing to climate change per unit of mass. A recent study concluded that replacing high-GWP HFCs with low-GWP alternatives could avoid 0.1°C of warming by 2050. Fast action under the Montreal Protocol could limit the growth of HFCs and avoid up to 0.5°C of warming by 2100. HFCs can be most effectively controlled through a phase down of their production and consumption. 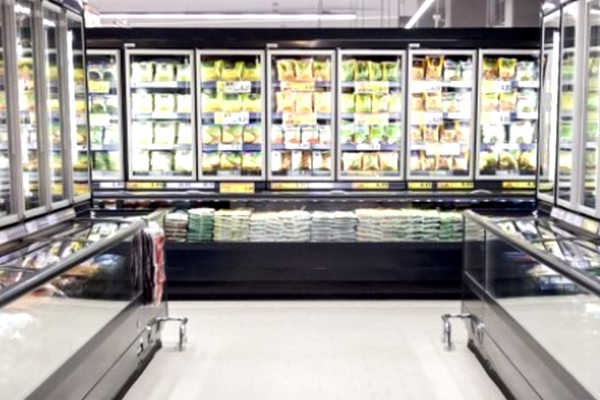 In addition to the direct climate benefits from HFC mitigation, a global HFC phase down could also provide indirect benefits through improvements in the energy efficiency of the refrigerators, air conditioners, and other products and equipment that use these chemicals. These efficiency gains could also lead to reduced emissions of CO2 and other air pollutants. This factsheet gives an overview about the importance of Hydrofluorocarbons (HFCs) and the urgent need to take action to reduce emissions.